This year, surprise Mom with a special delivery straight from Pixie Hollow -- pint-size arrangements that will last the whole year through. Just "pick" up a package or two of colorful flower stickers, and young fairy-fan florists will be in business in no time. 1. 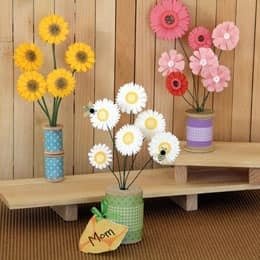 For the flower "vase," wrap strips of colorful paper around the center of the thread spool and use glue dots to hold the overlapped edges in place. You can even layer two or more color/patterns, if you like. If you want a tall vase, glue one thread spool atop another, leaving the center holes open for inserting the flower stems. 2. To create the flowers, snip the wire or pipe cleaners into the desired lengths for the stems. Tip: You can also bend a longer length into a V-shape to create pairs of connected flowers. 3. Roll an 8 1/2- by 2-inch piece of beige or golden brown cardstock into a tube, making the diameter just wide enough for the narrower end of the egg to nestle in. Staple the tube where the paper overlaps. Wrap the lower tube with blue paper for Goofy's pants. Then wrap a purple strip of paper three quarters of the way around the upper tube for a vest. 4. Arrange the flowers in the thread spool vase, and add two or three honeybee stickers, if you like. Presto! -- Your fairy bouquet is ready to present to Mom.